I was trying to come up with something new and different to do with all our broccoli and cauliflower last weekend. Typically I just steam it or bake it in the oven with a bit of oil and salt but I wanted something a bit more savory and decided to try my hand at making a casserole with just the vegetables. It was so yummy that 1/2 of the 13x9 pan was empty by the time dinner was over! Step 1: Cut the broccoli and cauliflower into florets and bring to a boil. Boil for just 5 minutes so that the veggies are still crisp. Then drain. Step 2: In a separate pan melt the 4 tbsp butter and saute diced onions (or flakes). Add garlic and 4 Tbsp flour. Mix butter and flour mixture to make a roux. Slowly add in milk, chicken broth, and ranch dressing mix over medium- high heat stirring almost constantly. Continue cooking until thickened. Step 3: Pour broccoli and cauliflower mixture into a 13 x 9 pan and stir together with the milk mixture and the shredded cheese. Step 4: Melt the remaining teaspoon of butter and crush the Ritz crackers; then mix together and spread over the veggies. Step 5: Bake at 350 for 20 minutes or until bubbly and crackers are slightly browned. 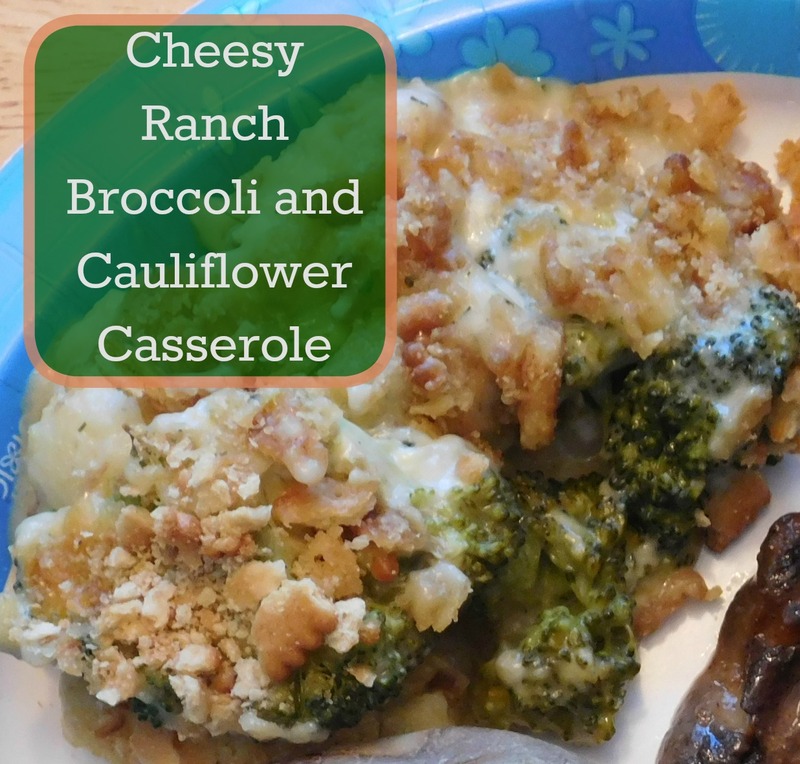 I love broccoli and cheese casseroles. I've never thought about adding cauliflower, but it sounds tasty. Thanks for sharing at Snickerdoodle. Pinning. Thank you for the pin! I thought the cauliflower added an extra texture; we often make broccoli casseroles but I rarely think of adding cauliflower. What a delicious way to prepare cauliflower and broccoli! So glad you've joined us again for the What's for Dinner party! Thanks! Every now and then we just have to mix up the veggies into something just a bit sinful.